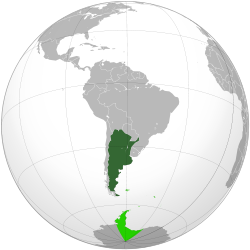 The Argentine Republic is located in the South and West Hemisphere. Its relative position in South America gives the country a diversity of land and culture. From the artic regions in the south, to the forested jungle regions in the north, from the ocean coastline on the Atlantic, to the rugged mountain regions in the west, and bordering five other countries, Argentina provides an important cultural and economic connection for all of South America. Argentina, officially the Argentine Republic (Spanish: República Argentina), is the second largest country in South America, constituted as a federation of 23 provinces and an autonomous city, Buenos Aires. It is the eighth-largest country in the world by land area and the largest among Spanish-speaking nations, though Mexico, Colombia and Spain are more populous. 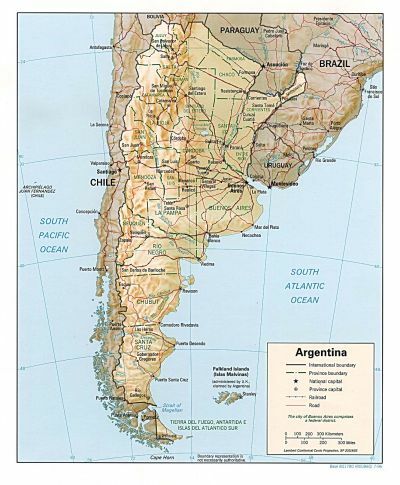 Argentina's continental area is between the Andes mountain range in the west and the Atlantic Ocean in the east. 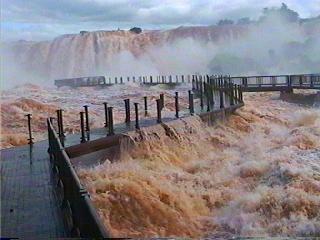 It borders Paraguay and Bolivia to the north, Brazil and Uruguay to the northeast, and Chile to the west and south. Argentina is nearly 3,700 km long from north to south, and 1,400 km from east to west (maximum values). It can roughly be divided into four parts: the fertile plains of the Pampas in the center of the country, the source of Argentina's agricultural wealth; the flat to rolling, oil-rich plateau of Patagonia in the southern half down to Tierra del Fuego; the subtropical flats of the Gran Chaco in the north, and the rugged Andes mountain range along the western border with Chile. The highest point above sea level in Argentina is located in Mendoza. Cerro Aconcagua, at 6,962 meters (22,834 feet), is the highest mountain in the Americas, the Southern, and Western Hemisphere. The lowest point is Laguna del Carbón in Santa Cruz, −105 meters (−344 ft) below sea level. This is also the lowest point on the South American continent. Due to the higher gravity force in Laguna del Carbón, a pendulum clock, if not corrected, will advance 24 seconds a day. The geographic center of the country is located in south-central La Pampa province. The country has a territorial claim over a portion of Antarctica (unrecognized by any other country), where, from 1904, it has maintained a constant presence. Today, there have been 23 visitors (43 hits) on this page!